Create bonding with another single individual by making your own kite and share the Unique experience together. 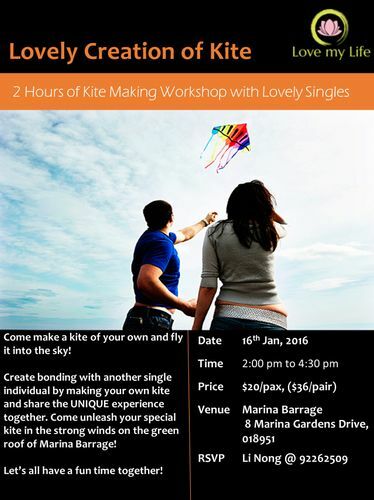 Come and unleash your special kite in the strong winds on the green roof of Marina Barrage! - And Fly It All to The Sky! Let’s all have a fun time together! Please feel free to contact Li Nong at 92262509 if you are interested and wanna ask anything about it!